I always assumed that there were approximately zero things I enjoyed about the end of summer—goodbye sunshine, warm weather, long sunlit days, eating dinner outside, picnicking, ice cream in the afternoon…need I go on?—but this morning, the first morning so far this school year that I have worn a scarf while taking my son to school, it occurred to me that there is, in fact one thing I enjoy about summer’s end. I get to start baking bread again. There are many people, of course, who take kindly to baking bread year round, and I wholeheartedly salute those people. But it remains a fact that I am simply not one of those people. During the summer, I prefer to not turn on my oven, and instead make a concerted effort to concoct all of our meals via the magic of a cutting board, a salad bowl, a grill, and/or a single burner on the stove. Eventually, come autumn, when the weather takes on its inevitable chill, and keeps that chill for the better part of eight months, the oven will come on, and stay on, producing breads and baked goods aplenty. 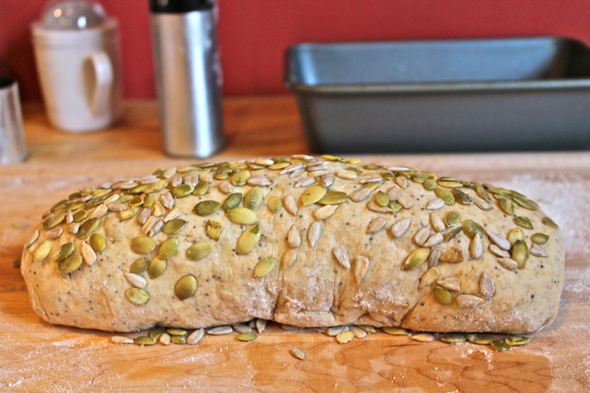 I baked this particular loaf of bread before summer officially began in Portland. The weather was still rather chilly, and I was craving the comfort of a freshly baked loaf of hearty bread to keep me company. 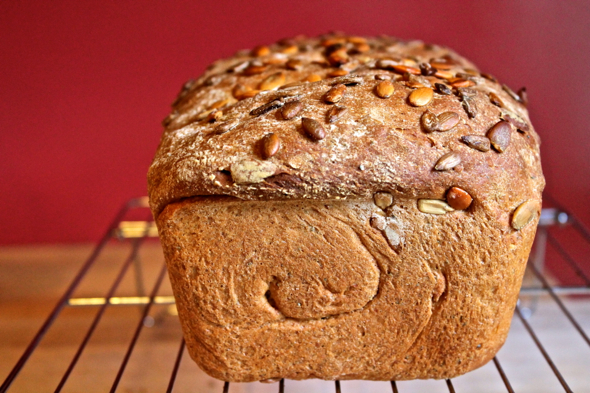 Packed with every type of seed I could find in the house, this is a bread for the ages. It is great for sandwiches, perfect as toast, and it will fast become your best friend if swiped with a touch of salted butter and drizzled with a wisp of honey. Best of all, however, is the fact that this bread seems to beckon people, particularly children, with its heavenly aroma and nutty bite, so, really, you won’t ever find yourself with simply the bread alone to keep you company. 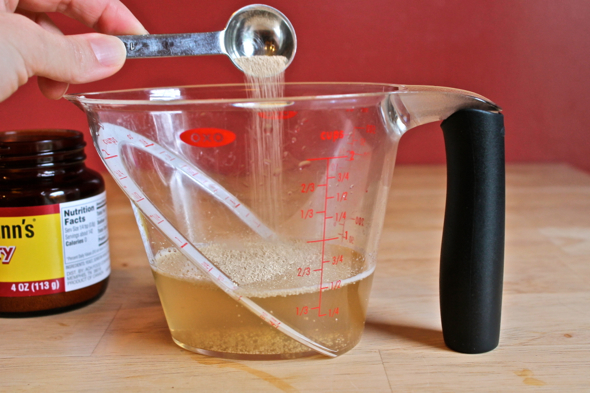 In a small bowl or measuring cup, combine the warm water with the yeast and one tablespoon of the honey. Stir to dissolve, then allow to stand at room temperature for 10 minutes, until nice and foamy. In a large bowl, or in the bowl of a stand mixer fitted with the paddle attachment, combine the warm milk, the remaining tablespoon of honey, the butter, and the yeast mixture. 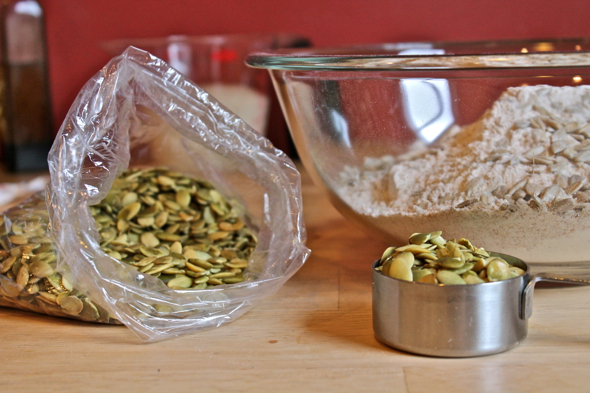 Stir to combine, then add 1 cup of the all-purpose flour, all of the whole wheat flour, salt, and the sunflower, pumpkin, poppy, and sesame seeds. Beat on medium-high speed for 3 to 5 minutes (3 minutes with a stand mixer, 5 if mixing by hand), until a smooth dough forms. Lower speed to medium low, and continue to beat the mixture while adding the remaining 1 cup of flour, 1/3 of a cup at a time, until the dough becomes shaggy. Turn the dough out onto a lightly floured surface or, if mixing the dough in a stand mixer, replace the paddle attachment with the dough hook. Knead the dough until it becomes smooth and silky, adding just a teaspoon or so of flour if the dough is too sticky to knead. If kneading by hand, you’ll work with the dough for 5 to 6 minutes. If kneading with a stand mixer set on a lower speed, your kneading should be complete in 3 or 4 minutes. Form the dough into a ball, then place in a greased bowl to rise. 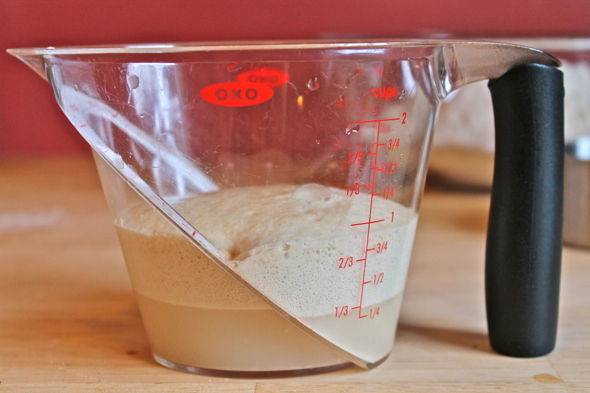 Make sure that every part of the dough gets greased at least a little bit, lest it stick to the bowl as it rises. Cover the bowl with plastic wrap, a large lid, or a moist towel, and allow to rise at room temperature until doubled in size, about 1 hour to 1.5 hours. Carefully deflate the dough, then turn out onto a well floured surface. Grease a 9” by 5” loaf pan. 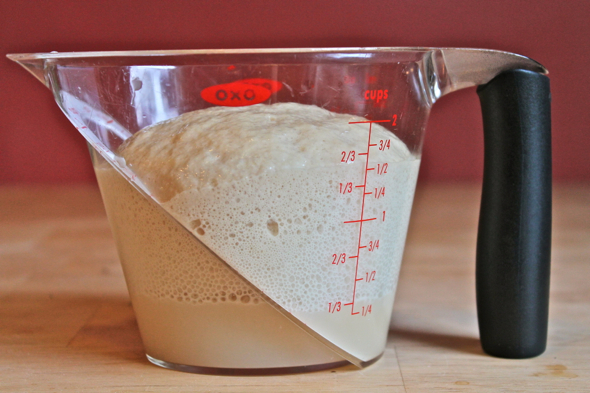 Form the dough into a rectangle that is approximately 9” wide and 6” tall. 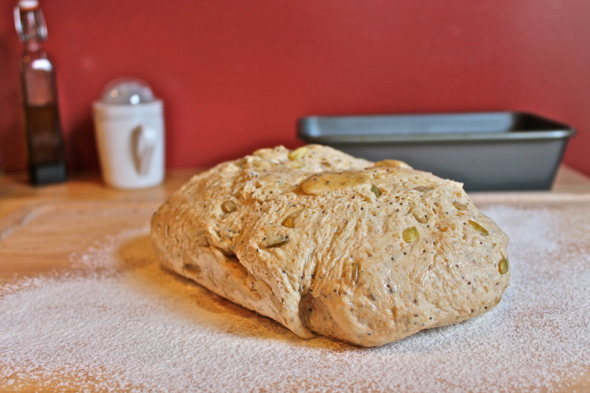 Roll the dough into a tight loaf, pinching the seam closed at the end. Lightly brush or spray the loaf with just a bit of vegetable oil. 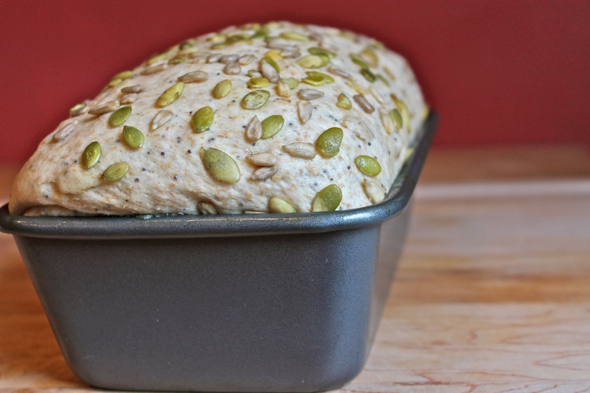 Sprinkle about 1 tablespoon each of pumpkin seeds and sunflower seeds on your work surface, then roll the greased loaf in the seeds, covering as much of the loaf as possible. Place the loaf in the greased 9” by 5” pan, cover lightly with plastic wrap and allow to rise until the dough has reached at least 1 inch above the rim of the pan, about 45 minutes to 1 hour. While the dough is rising, preheat the oven to 375 degrees Fahrenheit. Bake the bread in the center of the oven for 40 to 45 minutes, until the crust is golden brown and the bread has an internal temperature of about 200 degrees Fahrenheit. Turn loaf out onto a wire rack to cool completely. Oh Yum!!! I can’t wait to make this with a good vegetable soup… MMM! Thank you! 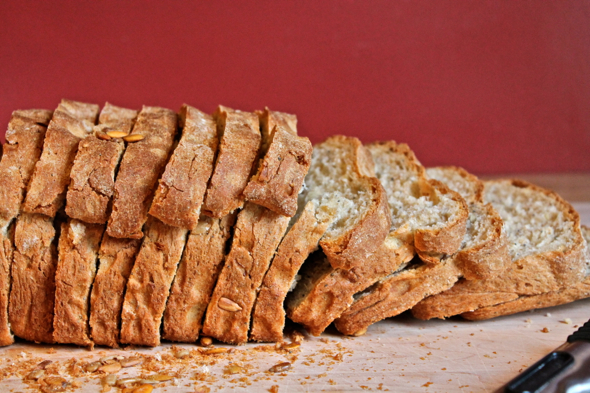 You can totally make this bread. It’s a casual sort of loaf, and I am certain that you would have no problem at all turning one out in your own kitchen. Take the plunge! Wow, that is one pretty loaf of bread! I am going to find out how it tasts soon, as it is the soup and bread season again. Thanks for the recipe! I’m allergic to wheat and was wondering if you have any suggestions for a gluten-free version of this bread? Hmmm…I have to admit, I have no experience baking gluten free bread. Have you ever perused http://www.thefreshloaf.com? It’s a great website for amateur bread bakers, and it’s filled with tons of great bread baking information. I’ll bet there are some really helpful tips there for baking gluten free bread. Hope this helps!